Guest Post: ‘Üpahats’ by Moochin’ Photoman. Look it’s right in front of you. I AM looking. Can’t see it. Aye lookin’ but yer not fucken seeing are ya. All I can see is a German thing and an arrow pointing up. That’s an umlaut on top of the Ü.
Kaaay. I don’t know any fucken German cept Achtung Baby ffs. Fucken hate U2. Read it though, go on. Up the Hats. Is that a dollar sign? Is the dollar going up or something? Aye but say it quicker. 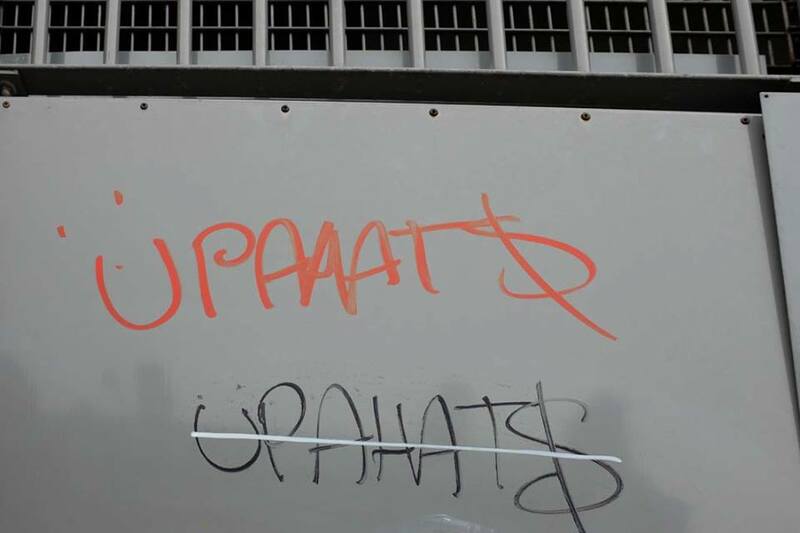 Upahats. It’s having a go at the Up the Hoods UTH shite I think. Oh right … Why the umpout thing? Umlaut ffs. I dunno do I? Got us talking about it though, eh? Hmm. I always thought that a dollar sign has 2 bars down. Not one. The pound sign has 1 across not 2. That’s how I remember it. Not sure about the Euro though. What the one line or two line thing? No. Yeah. You know, remembering things. Oh aye what is it? This entry was posted in Uncategorized and tagged Belfast, dollar sign, German, graffiti, Literature, Photography, short story, U2, umlaut, up the hoods, Upahats, writing. Bookmark the permalink.